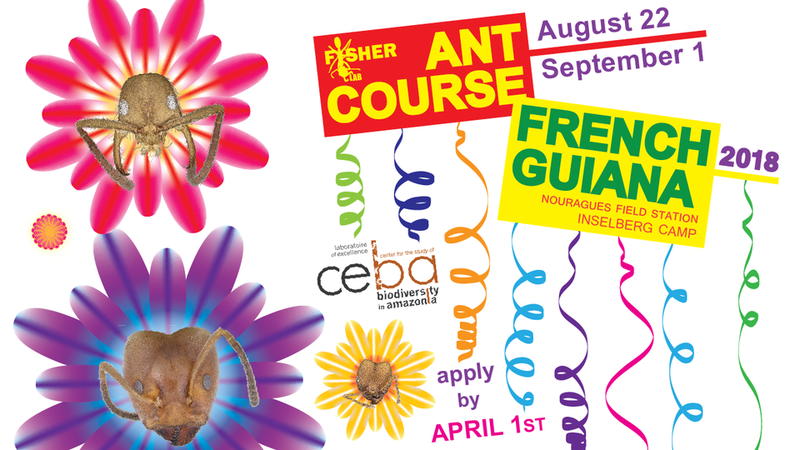 The 17th ANT COURSE will take place in French Guiana, at the Nouragues Field station, Inselberg Camp, from the 22 August to the 1 September 2018. ANT COURSE is open to all interested individuals (professionals, motivated amateurs such as citizen scientists, undergraduate and graduate students, postdocs, and professors). Priority is given to applicants currently researching ants. An entomological background is not required. We aim to include students with diverse interests and experiences in biology, including systematics, evolution, ecology, behavioral biology, neurobiology, genetics, global change biology, and conservation. The high ratio of instructors to students allows all attendees to receive a great deal of individual attention. ANT COURSE is presented in English and limited to 17 participants. Deadline for applications is 1 APRIL 2018.